While staying in LA this fall I plan on seeking out as many gardens as possible. One of the first stops on my garden tour was the Rose Garden at Exposition Park. 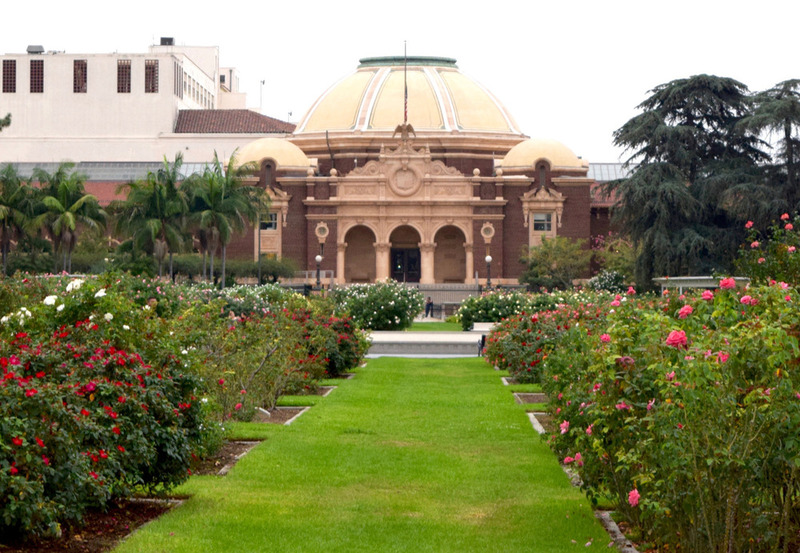 This sizable sunken garden is nestled among several sports arenas, the Science Center, and the Natural History Museum. An ornate brick wall borders the entire garden and a line of impressive trees block out the bus stop and noisy traffic beyond. The garden has a peaceful quality but it is pleasing to see that enough people seem to make use of the area, including a fair number of amorous young couples. In its heyday it was heralded as “the largest rose garden in the world,” and is said to include around 200 different varieties of flowers. The garden has been threatened several times by different development schemes, but public outcry helped champion the cause, and in 1991 it was added to the National Register of Historic Places. It was understandable that the main fountain was off during my visit because of the CA water shortage, but I’d imagine it would complete the scene. A semi-cloudy day with a slight breeze turned out to be the perfect setting to enjoy the garden to the fullest. Every passing wind wafts that intoxicating floral fragrance down the grassy pathways between flowerbeds. The roses almost seemed to be lit from within and glowed bright against the gray skies and the green of their surroundings. It was fun to amble through the lanes, pulled about by all the competing colors all vying for our attention, and laughing at the amusing names listed on labels (Judy Garland, Pink Promise, Strike it Rich! ).